Website for the Egyptian Ministry of Communications Egypt's Ministry of Communications is amongst the first live web addresses. Arab nations are leading a "historic" charge to make the world wide web live up to its name. Net regulator Icann has switched on a system that allows full web addresses that contain no Latin characters.Egypt, Saudi Arabia and the United Arab Emirates are the first countries to have so-called "country codes" written in Arabic scripts.The move is the first step to allow web addresses in many scripts including Chinese, Thai and Tamil. More than 20 countries have requested approval for international domains from the Internet Corporation for Assigned Names and Numbers (Icann). It said the new domains were "available for use now" although it admitted there was still some work to do before they worked correctly for everyone. However, it said these were "mostly formalities". 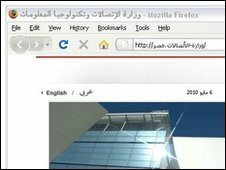 Icann's senior director for internationalised domain names, Tina Dam, told BBC News that this has been "the most significant day" since the launch of the internet, adding that "it's been a very big day for Icann, more so for the three Arabic countries that were the first to be introduced". Icann president Rod Beckstrom described the change as "historic".